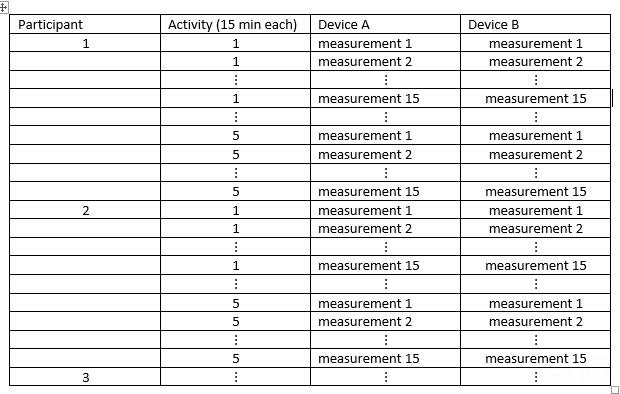 For each participant I have 75 (15 per activity X 5 activities) measurements each from device A and device B for the same variable. This gives me 750 measurements all together for each device. I want to analyse the agreement between the device A and device B measurements, measuring the same variable. If I’m comparing the two dependent variables (device A and device B measurements) does this study fall under a longitudinal study with repeated measures? For agreement analysis I intend to use methods Interclass correlation coefficient (ICC) and Bland-Altman analysis. How do I adopt these methods for my study design? Browse other questions tagged statistics correlation data-analysis or ask your own question. Is weighting by relative variance a meaningful way to weight variables? How to find the Maximum Likelihood Estimator, the expected lifetime and the probability of the following situation?